Sponsor Kamil Hasan (left) presented the first-place award for Raven by Reflex Robotics to team members Enes Mentese, Zubeyir Mentese, and Seongdo Kim. The second-place award went to Transcripter cofounders Arnaud Gallardo and Teo Fleming for their voice-recognition web site. Third-place winner Convene organizes ad-hoc events for people with matching passions. 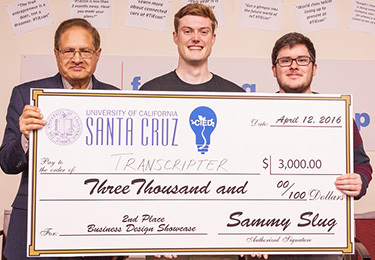 This year's Business Design Showcase competition organized by the UC Santa Cruz Center for Innovation and Entrepreneurial Development (CIED) featured 16 entries from either individual students or teams led by UCSC graduate or undergraduate students. A panel of entrepreneur judges selected first, second, and third place winners, after which all competing businesses displayed their product or service prototypes and gave their pitches in an open-forum reception. 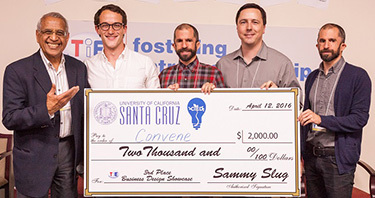 Attendees voted with their "Slug Bucks" seed-funding money for the People's Choice Award. Serial entrepreneur and UC Berkeley Haas Business School instructor Naeem Zafar gave the keynote address at the event, held on April 12 in the conference space of TiE Silicon Valley. First Place ($4000): Raven by Reflex Robotics, presented by Enes Mentese, founder, CEO, and lead hardware engineer; Abdo Babukr, cofounder and lead embedded systems engineer; Seongdo Kim, cofounder and lead software engineer; Brent Bucci, public relations & marketing; and Zubeyir Mentese, marketing, testing, and business development. Using Nvidia's Tegra X1, Raven is the world's first wearable, AI-powered robotic cameraman. Paired with a GoPro camera, Raven locks on, tracks, and captures footage of any moving object without having to touch the camera. Second Place ($3000): Transcripter, by Arnaud Gallardo and Teo Fleming, cofounders. A voice-recognition web site, Transcripter interprets and transcribes business meetings in real-time. Featuring several languages, Transcripter is compatible with a wide variety of users, offers multiple log-in options, and requires minimal setup. Third Place ($2000): Convene, by Rob Martin, cofounder and designer, and Chris Antoun, Matthew Antoun, and Aaron Springer, cofounders and developers. Do what you love, but don't do it alone. Convene organizes ad-hoc events for people with matching passions. Whether you're in town for a week or building a new life in a new city, Convene makes it easy to enjoy yourself and build meaningful friendships. People's Choice Award ($1000): Neighborhood, by Neil Raman, cofounder and director of business development; Louis Chatta, cofounder and CEO; and CJ Avery, cofounder and CTO. A location-based social application, Neighborhood connects college students by centralizing campus communication. From textbook exchanges and quick tutoring to ride sharing and organizing pick-up basketball games, your campus is now your own Neighborhood! Judges' Honorable Mention ($300): Coco's Underarm Potion, by Sofia Vermeulen, founder. All-natural, environmentally friendly, and healthy, Coco's Underarm Potion is your effective alternative to the typical deodorant. Judges' Honorable Mention ($300): Eva Kava, by Anthony Palavi, founder. A non-alcoholic relaxation beverage, Eva Kava is made from the root of the kava plant. Kava's active ingredient, kavalactone, provides the consumer with a mild euphoria and slight buzz. People's Choice Honorable Mention (missed People's Choice Award by a mere 13 Slug Bucks, with over 280 Slug Bucks received): UniTea, by Chase Armer, cofounder, CEO, and CTO; Erica Lee, cofounder and CFO; and Jeff Zhang, cofounder and CMO. A home appliance, UniTea consists of Boba Makers and signature T-Cups. The Boba Maker delivers a perfect blend of creamy Boba milk tea and chewy tapioca pearls into the T-Cup at the push of a button. The Business Design Showcase was cosponsored by UCSC Trustee Kamil Hasan and Talat Hasan; TiE Silicon Valley; Business With Pleasure; and UCSC's Division of Graduate Studies, Baskin School of Engineering, Office of Research, and University Relations.